MAC"S BACH on same property also available and could be rented together -Put the kids out the back and still have a romantic weekend on your own. We had a great time at Macs house in the weekend, perfect set up and will definitely be going back. # 2 nights usual min due to our costs. 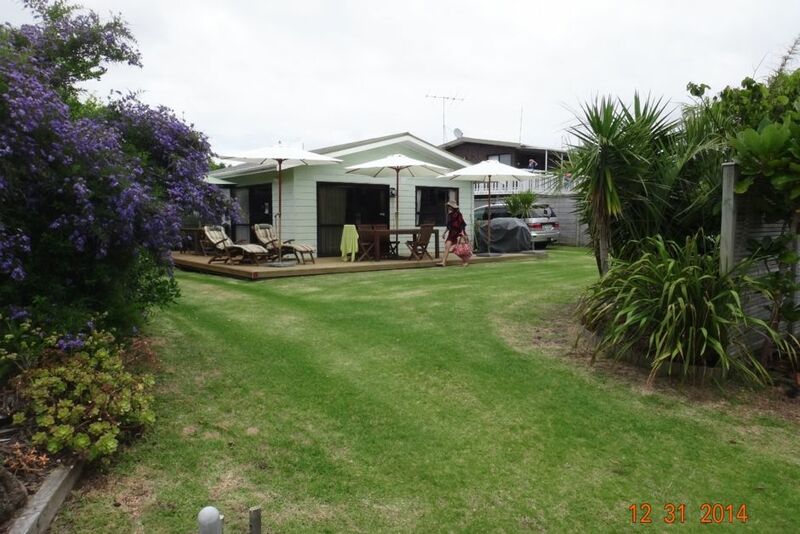 This is our family Kiwi bach or modest beach house offering a genuine NZ Kiwi beach experience. This is not a luxury holiday Home . It is no Wifii Available property to allow our Children and Grandchildren to get outside and explore and do things at the beach. There are excellent mobile phone services for internet access available though. Four minutes walk on the flat on the grass or quiet road to the bach. Two routes available. Sports equipment including tennis racquets ..
Mac's at Matapouri was a wonderful place to spend time as always. It feel like a home away from home. We had a very relaxing family time, booking both places to have a bit of extra space for 2 teenagers plus 3 adults. The house is comfortable and has a friendly feel and everything you need for a a few days away with well equipped kitchen for cooking and excellent outdoor space with umbrellas and furniture. The bach at the back is simple, modern, clean and spacious and very easy to be in - with great space and furniture and brollies for outdoor relaxing and eating. The beach is only minutes away, so easy for walking and swimming. Thank you J and J for another lovely time sharing your special place and your clear communication with us before our holiday. We LOVED Mac’s house and would recommend to family and friends! We had an amazing time at Mac’s house! It’s got a great feel to it with the family history and photos dotted around inside - a classic Kiwi Bach. The location is amazing with the beach an easy stroll down the road. And the local store 2 mins away. ps. We loved the plums from the tree in the garden. Lovely Bach. Comfy, well maintained well equipped. Provided everything we wanted and more. We booked very last minute with John and Judy. Nothing was an issue. Very easy to find and excellent location. They were fantastic in providing information about the local area, particularly with the children. Accomodation is brilliant, a typical Kiwi holiday at the beach. Lots of character in the property, and fun to read all the history. Everything provided to enjoy our stay to it's fullest. Thank you for hosting us. Great bach, lovely timber smell throughout and in a perfect secluded part of Matapouri a stones throw from the beach. Only feedback would be that the shower pressure and temperature could be greater, the fridges weren't overly cold either.